This article began as a conversation with Wang Hai Jun in 2009. His teacher Chen Zheng Lei had an article on his old website called “The Method and Progression of Chen-style Taijiquan Training” which address this topic. David Gaffney wrote an article for Wang Hai Jun about this topic in 2010 (Six Stages of Learning – David Gaffney) which was very helpful and which I would recommend to the reader. Several subsequent discussions with Wang Hai Jun caused me to revisit it and here is the current end result. There is an old saying in Chen Village that there are three requirements for the student to gain gong fu: a good teacher, good understanding and good practice. Within the learning process, if the student is to achieve the best results, the process of learning Taijiquan must be approached systematically. Chen style taijiquan training is divided into six stages, each laying down the foundation for the next. These stages provide a path to the use of taijiquan as a martial skill. (Wang Hai Jun has said that the usage of taijiquan can be considered the seventh stage.) These stages are learning the form, practising and correcting the form, moulding the form, smoothing the form, examining the form and dismantling the form. Each stage is necessary, must be passed through in order and none can be omitted without causing failure. The stages do not have discrete boundaries and there is necessarily some process of overlap between stages. However each stage is sufficiently broad that this overlap does not spread across three stages. A student cannot be learning the form and moulding the form simultaneously. The first stage of learning is called xue jia zi or “learning the form”. In this initial period of training students must learn the movements of the foundation form, the coarse choreography. In Chen village the conventional foundation form is the Laojia Yilu (Old Frame First Form), this being the vehicle through which all the subsequent, higher level skills are built. During this stage, the requirement is simply to become familiar with the sequence of movements and the general placement of the body e.g. where the weight should be, what direction the body should be facing and so on. This first phase is sometimes referred to as “planning the training path”. This part might be considered complete when the student can perform the routine unaided. The second stage is known as lien jia zi or “practising the form”. Once the movements have been learned, the student must practise diligently until they are completely familiar with the form. During this teacher the student’s teacher will provide choreographic corrections and guidance as to what the basic principles are e.g. song, peng, ding, chen, chan si jing etc. In this stage the learners should practice the form, until the sequence of movements become very familiar, in accordance with these basic principles. Practice is the key element. The corrections provided by the teacher will not take root in the student without a great deal of practice. Corrections to one posture need to be replicated throughout the form. Practice must be sufficient that these corrections become good habit and no longer require the student’s conscious mind to implement them. Only then can the next stage begin. This process of necessary sustained and sufficient practice sets a pattern for all subsequent levels. At this point the student will have attained the first level of skill of Chen Style taijiquan. Only a small percentage of people who begin the study of taijiquan reach this level even though it is with almost everyone’s grasp. The fourth stage is shun jia zi, which can be translated as “smoothing out the form.” This is the process of ensuring that there are no corners in the student’s movement. Remaining stiffness which inhibit the turning of the body is identified and the errors in silk-reeling in the lower body are highlighted by the teacher. This makes the form more fluid, natural and flowing. Even though the student’s posture has been corrected in the previous stage, their body still holds stiffness. Their movements may be like a machine that is not well-oiled. Now the training emphasis must be on becoming very smooth and very natural. After correction, the student should practise until their whole body becomes coordinated and flowing. Whether slow or fast, the movements should maintain the same quality. The student must not let their movements become scattered and dispersed if they speed up, letting the shoulders lift or allow their qi to rise. Their breathing is similar. For example, if we consider a sequence of movements where we breath in as we close and out as we open or, where we breathe in as we turn left and out as we turn right, there should be no change in this pattern whether you go fast or slow. This fourth stage, therefore, requires the student to become very fluid and smooth in their form. About this time the student will have attained the second level of skill of Chen style taijiquan. Of those students who reach the first level, only a very small percentage of people train with a good teacher and sufficiently hard enough to reach this level. Level two skill is unusual but still not sufficient for taijiquan usage. When this has been achieved, we enter the fifth stage of pan jiazi or “examining the form”. Pan has two meanings. One refers to examining and the other to the development of the lower part of the body, specifically the crotch and legs. Having undertaken the fourth learning stage the form will be achieved the requirements in terms of movements and postures. Now the student must go deeper and train gongfu into their body. Through careful and meticulous study they must examine every posture in turn. 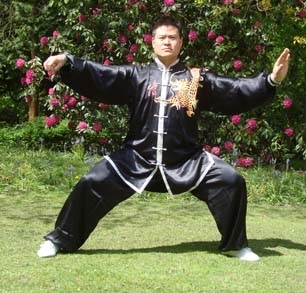 By taking a lower stance they can develop strength in the lower body (xiapan) and increase stability; ensuring that they fulfil the requirements of Taijiquan gongfu. Other aspects to be examined and trained are, for example, in whatever posture they take, make sure they are supported in all directions; the lower body is strong and the upper body light; whole body moving in unison and so on. The sixth stage is called cai jia zi or “dismantling the form”. Dismantling the form entails training until the function of every posture can be executed optimally. Taijiquan is a martial art, so at this stage they should start learning the applications of every posture. Training one movement at a time, this is the time when the student should start to work on the different body methods and applications contained within the form. At this point the student will have attained the third level of skill of Chen Style taijiquan. Of those students who reach the second level, almost none sufficiently hard enough to reach the third level of taijiquan skill. Level three skill is extraordinary, at the level of Olympic athlete. It is at this level that taijiquan skill can be used as a true martial art. Many teachers begin to teach applications before the student is ready. Teaching applications in this manner gives a student little chance of being successful. For example, even if you show a lock, they cannot use it effectively because their body is not working in unison and their movements are not coordinated. They are simply not ready. First their movements must become smooth. Their qi must be flowing and unblocked. Then the student should start to think about bringing every posture out i.e. learning the applications of the movements in the form. At this stage when the student practises, even thought there is no actual opponent, they train every movement as if there is an opponent in front of them. If all of these stages are completed one comes to a point where applications against a real opponent can be brought out at will. In a serious encounter they do not have to pause to think about their responses. Instead the most appropriate and effective reaction will naturally come out. This level of skill is the ability to ‘yong jia zi,’ or “use the form”. A student must have a clear picture of how to train correctly to achieve a good end result. Often students simply have the wrong idea of how to train and in their minds they are not convinced of the method. When they practise they should make sure that they follow these six steps. Throughout the learning process they must have patience and not be in a hurry. First try to discard their hard strength. In the early stages of learning a student is repeatedly told to fang song (let go of stiffness in the body). Many people genuinely feel that they are relaxed, when in taijiquan terms, they are still quite tight. The result of this tightness is that their body movement is very stiff and is not led by the waist. Letting go of their hard strength allows them to develop a very strong root, to co-ordinate their breathing with their movement, and to improve their qi and blood circulation. A common problem is for people to be in too much of a hurry to learn the martial applications contained within the form. Whilst being taught the details of a particular movement or posture, all they want is to learn the applications. However, their postural and movement principles are not correct. It is not useful to teach applications until all the stages are passed and Taijiquan principles are imbued within the body. They should reach a stage where everything feels very comfortable and natural as if it is part of them. Once this feeling is achieved consistently, it sends a message to their brain that everything feels correct, comfortable and balanced. They should first find this sensation. To achieve this they must be prepared to discard their old habits and learn to use their body in a new way. Throwing out their hard strength allows them to grow a new type of strength. If they use their hard strength, there is no place to grow this new strength. Those unwilling or unable to give up their hard strength will not be able to realise Taijiquan’s unique method of releasing power (fajin). Without giving up this hardness they cannot reach a level where all movements follow the silk-reeling principle, with every part turning, generated from the waist and from the dantian. First the dantian moves, which in turn moves their body. It is critical to move in this new rotational way. A Taijiquan saying is “the slow method of learning is the quickest way to succeed.” At first glance, this seems contradictory but training slowly gives time to think about the rules. In Taijiquan every part of the body is governed by its own rule. After they have trained these rules into their body they no longer need to think about them. Whether they move fast or slow it is the same, the rules should remain the same whatever speed they adopt. At the beginning when they move, mindfully control the turning of their body, the turning of their knees, which subsequently turn the ankle, thus rotating the whole leg. In time they do not need to think about it anymore, because their body is able to execute this movement instinctively. But this distinctiveness needs training. When they train for a long time they will achieve this. Only after this can they begin to learn the applications.